Emily Clarke of Greenwich High School competes in the floor exercise during the 2013 FCIAC Girls Gymnastics Championships at Westhill High School in Stamford, Saturday, Feb. 16, 2013. But all eight Wilton gymnasts scored in at least one event as the Warriors finished with 134.8 points, edging Ludlowe (133.350) and Trumbull (129.5). Staples (129.150) was fourth followed by Fairfield Warde (127.750), Darien (119.400), Greenwich (108.450), Westhill (105.0) and New Canaan (86.850). The key to Wilton's victory was sweeping second place through fifth place in the balance beam. Ashley Bascom (second), freshman Sam Farhi (third, 8.75, her lone event), Annie Saltarelli (fourth, 8.7) and Christina Brandt (fifth, 8.6) were the heroes. Fairfield Ludlowe gave Wilton all it could handle thanks in large measure to sophomore Perry Kindel. Despite finding out this week that the pain she was feeling was a stress fracture in her back, Kindel was not to be denied FCIAC glory. 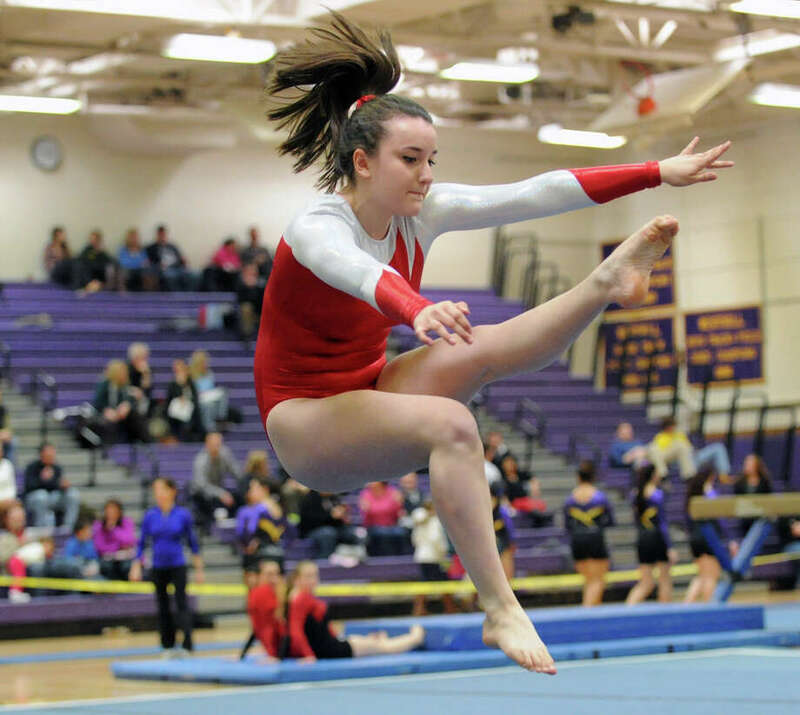 She is 2013 FCIAC champion in vault (9.1), beam (9.3), floor exercise (9.1) and all-around (35.5). Nicole Huntsman was second on bars and fourth in all-around for Ludlowe. "I struggled on my first rotation on bars (tied for 5th, 8.0). Then I settled in," Kindel said. "FCIAC titles were what I wanted all regular season. I was going to fight through the pain to get them. I'm so happy for our team. To finish second this year after placing fourth last year is a big step. My plan right now is to pass on the state class meet next week, but compete in the State Open." Sophomore Kathleen Piscotta took third-place in the bars and fifth overall, helping Warde to its fourth-place finish. TEAM SCORES: 1, Wilton 134.8 points; 2, Fairfield Ludlowe 133.350; 3, Trumbull 129.500; 4, Staples 129.150; 5, Fairfield Warde 127.750; 6, Darien 119.4; 7, Greenwich 108.450; 8, Westhill 105.0; 9, New Canaan 86.850. VAULT: 1, Perry Kindel (Ludlowe) 9.1; 2, Christina Brandt (Wilt) 8.9; 3, Tara Oliver (Trum) 8.7; 4, Caitlyn Longwell (Trum) 8.55; 5, Anna Violette (Stap) 8.5; 6, Deanna Baris (Stap) 8.45. BARS: 1, Tara Oliver (Trum) 8.6; 2, Nicole Huntsman (Ludlowe) 8.55; 3, Kathleen Piscotta (Warde) 8.2; 4, Anna Violette (Stap) 8.1; 5, (tie) Ashley Bascom (Wilt) , Nicole Kirven (St. Joseph), Perry Kindel (Ludlowe), Annie Saltarelli (Wilt) 8.0; 9, Andrea Mahieu (Stap) 7.9. BEAM: 1, Perry Kindel (Ludlowe) 9.3; 2, Ashley Bascom (Wilt) 9.1; 3, Sam Farhi (Wilt) 8.75; 4, Annie Saltarelli (Wilt) 8.7; 5, Christina Brandt (Wilt) 8.6; 6, Caitlyn Briganti (Trum) 8.5. FLOOR EXERCISE: 1, Perry Kindel (Ludlowe) 9.1; 2, Christina Brandt (Wilt) 8.85; 3, (tie) Annie Saltarelli (Wilt), Deanna Baris (Stap) 8.8; 5, (tie) Kathleen Piscotta (Warde), Payton Piedmont (Wilt), Anne Moeder (Ludlowe) 8.75; 8, (tie) Tara Oliver (Trum), Nicole Huntsman (Ludlowe) 8.6. ALL-AROUND: 1, Perry Kindel (Ludlowe) 35.5; 2, Christina Brandt (Wilton) 34.150; 3, Tara Oliver (Trumbull) 34.1; 4, Nicole Huntsman (Ludlowe) 33.3; 5, Kathleen Piscotta (Warde) 32.850; 6, (tie) Ashley Bascom (Wilt), Anna Violette (Stap), Nicole Kirven (St. Joseph) 32.55.